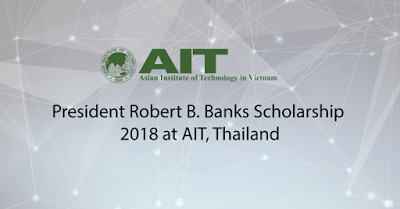 Asian Institute of Technology, AIT is now accepting applications for the President Robert B. Banks Scholarship, 2018/2019. The family of the late Prof. Robert B. 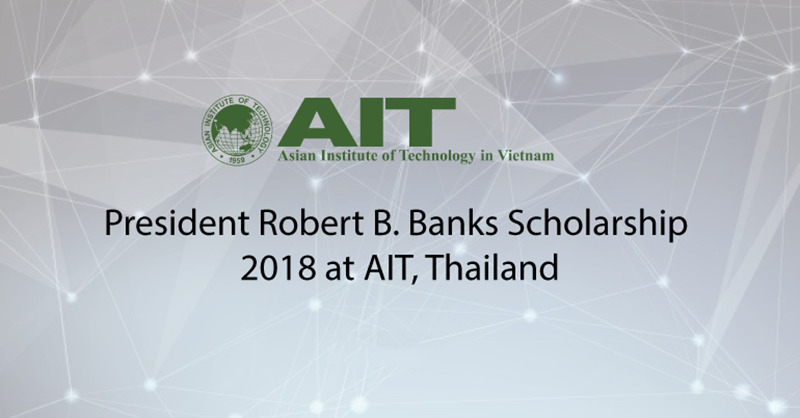 Banks has announced the creation of a new perpetual annual master’s scholarship to be awarded to a most deserving applicant, in memory of the late AIT President, Prof. Robert B. Banks, who had served as AIT’s third President from 1977 to 1983. The scholarship awardee is expected to have the highest academic credentials and financially deserving. The scholarship is open to all academic programs of all the three schools at AIT. President Robert B. Banks Scholarship Eligibility. The applicant should first meet all the AIT criteria for master’s admission for scholarships including English language requirement. The scholarship is open to all candidates. President Robert B. Banks Scholarship Benefits. How to Apply for President Robert B. Banks Scholarship.